The fruit of the prickly pear cactus, also called cactus fig or Indian fig has a rugged and -- as you would imagine -- prickly outer skin. Underneath is a delicious, sweet fruit. It can be something of a chore getting through to the fruit, but it's worth the trouble. 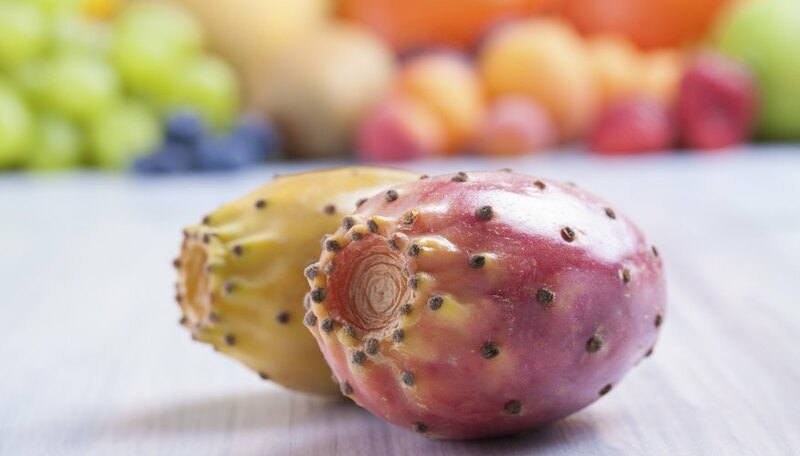 Choose a prickly pears with a deep color -- either orange or purple for the sweetest fruits. If you have a store-bought prickly pear, the spines of the pear have probably been removed, which means you can handle it with your bare hands. Handle an unprocessed prickly pear with canvas work gloves and place it in a bowl of cold water. Rub away the spines with an abrasive kitchen scrubber. Or, cut the spines off with a knife. Remove the skin, while still wearing your gloves, by slicing the top and bottom off with a sharp knife. Cut along the skin of the pear from top to bottom, making the indent deep enough to insert a knife in and peel off the skin. Chop the prickly pear into pieces. Farmers' Almanac: What the Heck Is a Cactus Pear?